As my Dad used to say: “it’s been another fun-filled week around here!” Good projects, good people, good food. What more can you ask for? And now I’m ready to move full-speed into the weekend. It’s pouring down rain here in Helsinki, but I have high hopes for a sunny Saturday so that I can put the new fence around my allotment garden – last year the rabbits had a nightly feast on onions, kale, and anything else edible that reached the soil’s surface. Not this year. I’m saving the produce for myself and my friends. Those bunnies? They’ll have to find sustenance elsewhere. I’ll plan to plant the cold-tolerant crop seeds during the coming week: parsnips, spinach, mache, carrots, bok choy, potatoes…the veggies I think…hope…can withstand the chilly temperatures of the Finnish April, where the temps still drop to +1 or +2° C every night. BRRRRR! Come on, Spring! We’re ready for you. As promised last week, here’s a round-up of some of the news links I loved from this past week. I hope you enjoy! People are getting hungrier for farm fresh food – how do we satisfy that need? Potential food waste becomes healthy snacks in the UK. Always timely: Modern Farmer shares tips on how each of us can minimize food waste. Is obesity becoming a national security threat in the US? Many say yes. Why should be eating Quinoa if you aren’t already: Quinoa, Magnesium and Belly Fat. Have a hard time eating veggies, but don’t love salad? In Japan, they’re making salad disguised as cakes, and it’s a huge hit! On air travel rather than food: could you fly long-distance and arrive without jet lag? Maybe – on Airbus’s new and improved plane, the A350. There’s a new school of thought for sustainable seafood, driven by chefs. 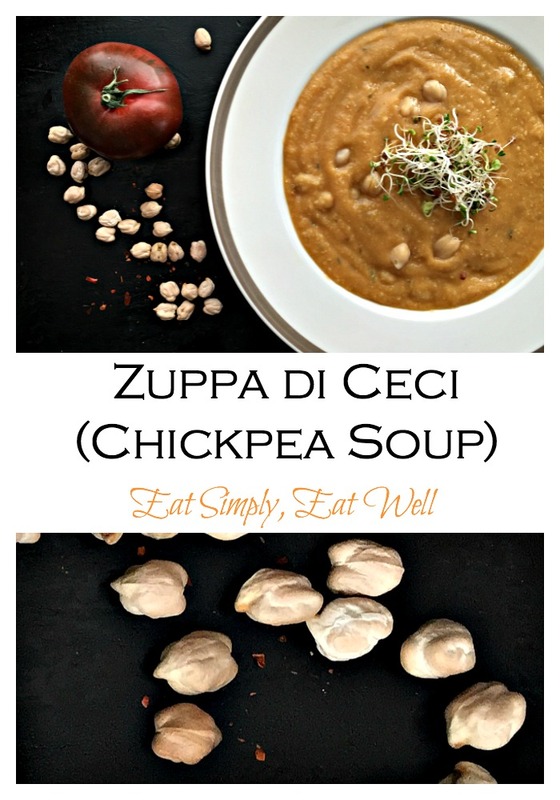 And because no weekend should begin without delicious food being involved, I bring you this beloved recipe from Tuscany: Zuppa di Ceci or Chickpea Soup. I enjoyed this in a back-alley restaurant in Rome – a modernized trattoria celebrating Bufala Mozzarella. And the mozzarella was indeed amazing…but it was this soup that stole my heart away. I’ve made it many times already since returning home, and it’s one of the easiest, most delicious & nutritious soups you could ever hope for. Fragrant with rosemary enhanced by just a pinch of chili, this soup and a slice of good sourdough is all you need for a hearty, happy meal anytime. 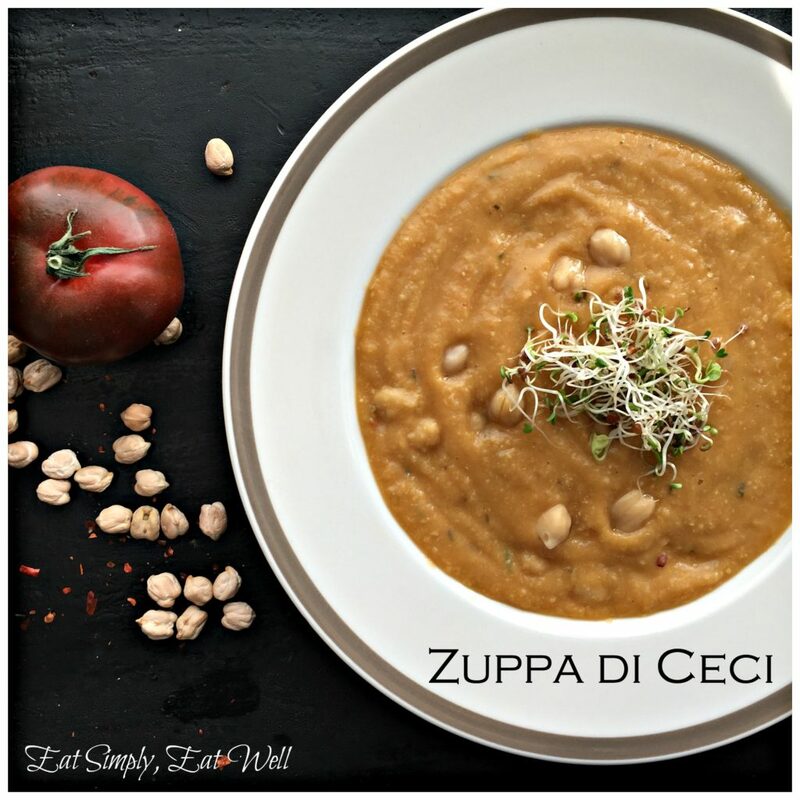 There are many versions of Zuppa di Ceci out there – this is mine. I hope you love it as much as we do! Heat the olive oil in a pot over medium heat. Add onion, celery and carrot, and saute until tender and translucent; about 5 minutes. Add the garlic and rosemary and cook one minute more. Add 3 cups of chickpeas + chickpea liquid to the pot (reserve the rest of the chickpeas for later). Add the tomato paste and chili flakes. Pour enough water into the pot to just cover the top of the chickpeas (the amount will depend on how much chickpea liquid you have already added). Bring the soup to a boil, lower to a simmer, and cook an additional 5 minutes. Remove from heat. Puree the mixture until smooth with an immersion blender. Alternatively, transfer the soup to a blender and puree until smooth. Warm the remaining chickpeas in a small pot with a little water, or in the microwave until they are warm to touch. Add the chickpeas to the soup, reserving a few to garnish each bowl. Taste the soup, and adjust the amount of salt and pepper to your liking. Divide the soup between 4 bowls, garnish with a few chickpeas and a small handful of sprouts, and enjoy. Did you like this post? If so, please leave a comment below and share it with your friends! Have you signed up for the ESEW newsletter yet? If not, scroll back up to the top of this page and fill out the form on the upper right-hand side so you can get the free recipes and tips I send out to subscribers. This is simply but very tasty soup! Thank you for sharing this recipe. Maybe i’ll add it to my restaurant menu.